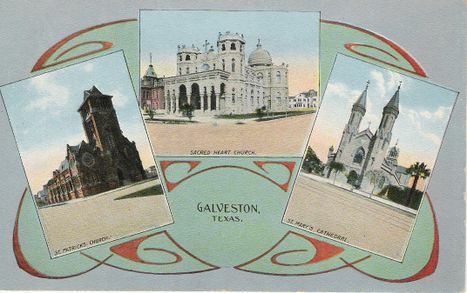 Guests can see Something Old, Something New: Galveston’s Distinctive Architecture as depicted in Historic Postcards and Paintings from the Rosenberg Library’s Collection as part of ArtWalk at The Tremont House, 2300 Ship’s Mechanic Row, on Saturday, Nov. 28 from 6 – 9 pm. Something Old, Something New will feature color postcards and paintings highlighting Galveston’s historic buildings and their unique architectural traits. The presentation will include postcards from the early 1900s to the 1950s, including many images from the Forshey Collection. Featured buildings include Union Station, Tremont Hotel (1872-1928), and the original John Sealy Hospital. Rocky and Sherrie Forshey donated more than 700 postcards of Galveston to The Galveston and Texas History Center at Rosenberg Library in February 2009. This is the final presentation of postcards from this collection that has been featured during ArtWalk. Guests at the exhibit will have the opportunity to purchase reproductions of some historic postcards and other images that are part of Rosenberg Library’s collection. Sales will benefit the Rosenberg Library. Rosenberg Library, located at 23rd and Sealy, suffered extensive damage from Hurricane Ike. The Library is currently serving the public as it continues to rebuild. To make donations toward the recovery of Rosenberg Library visit www.Rosenberg-Library.org or call (409) 763-8854. The Tremont House will host the last of a series of historic postcard exhibits by Rosenberg Library as part of ArtWalk on Saturday, Nov. 28 from 6 to 9 p.m.